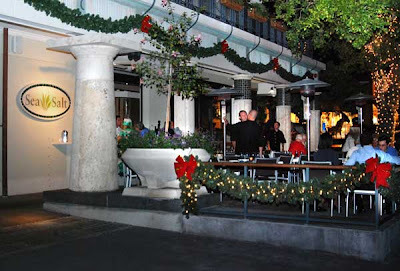 Sea Salt is an elegant young lady in town, the "newest kid on the block", on Naples 3rd Avenue South, a gnocchi’s toss from Campiello and just north of Tommy Bahama’s. The Sea, as in the Gulf of Mexico and Naples beach, is two blocks away. And the food? Chef Fabrizio Aielli can cook! 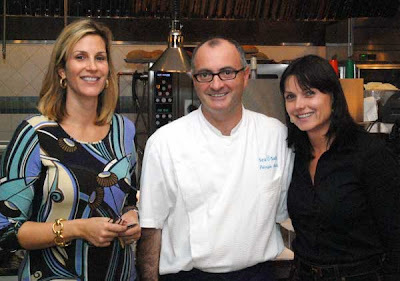 Previously, in 1999, he and wife Ingrid opened his highly successful restaurant, Washington D.C.’s tony Teatro Goldoni, and groomed it into a “must visit” spot. They sold it in 2007, moved to Naples, and just opened Sea Salt a few weeks ago. 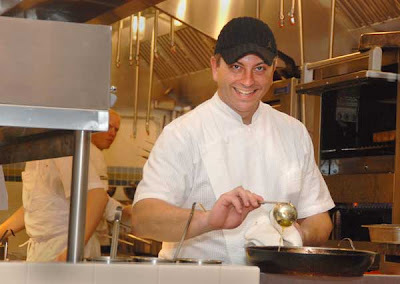 A 2002 James Beard Foundation Star Chef Award Recipient, and a former chef at Naples Winter Wine Festival, he’s nationally respected. While Chef Fabrizio is clearly “hands on” in the kitchen, the front of the house is covered by personable, artistic Ingrid. Active partner Lili Montes minds the financials and other details. Lili Montes, Chef Fabrizio and Ingrid Aielli They gutted a failed clothing store, and created an elegantly simple, beautiful setting for lunch and dinner. The patio is the perfect spot to people watch on 3rd Ave S. The curved outside bar is a favorite vantage point. 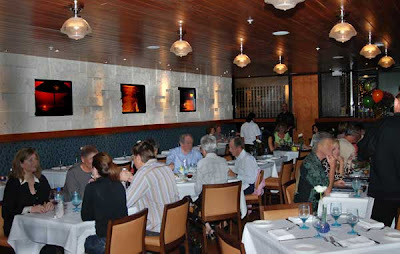 Clyde Balch, Lobster Bisque and Server Inside, there's wooden floors and ceilings, and the 3 dimensional limestone wall featuring inset color photos of Old Naples. 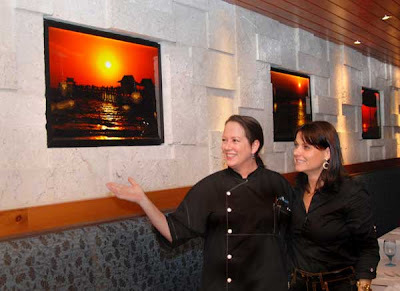 Gina and Ingrid at 3-D Limestone wall with Naples Photos This is a freshly designed concept. 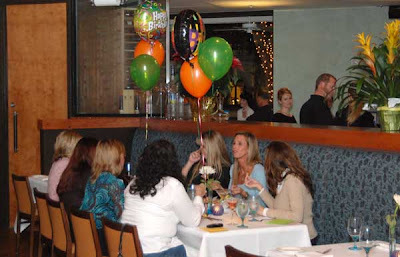 From the white tablecloths and napkins, to the servers attractive black uniforms with striped aprons, a lot of thought has created Old Naples newest spot to "see and be seen". 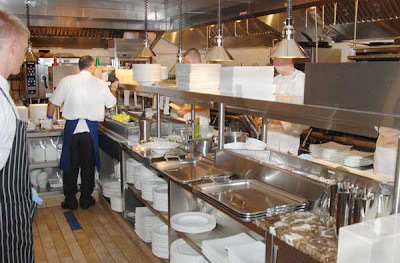 My favorite spot would be the true Chef’s Table, a table that can sit 8, smack dab in the kitchen's center. 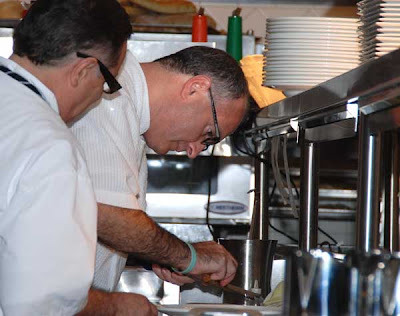 Whether you are a foodie, or just curious about the inner workings of a commercial kitchen, this is the place to be! We sat at Table 54, to both view the dining room and look into the kitchen, ably served by attentive Gina. 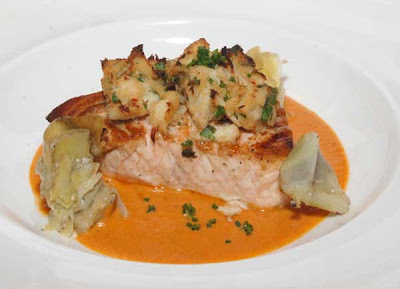 Ingrid told us that Chef Fabrizio has several vendors for just seafood alone, and several for primarily organic produce. 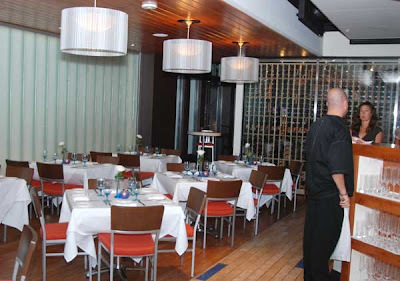 A look at the fresh seafood and produce, and the lack of odors in the kitchen attest to his meticulous nature, and passion for cooking with only the freshest ingredients. He’s passionate about salts, with over 100 salts from around the world, and yes, you can easily taste the difference between salts! 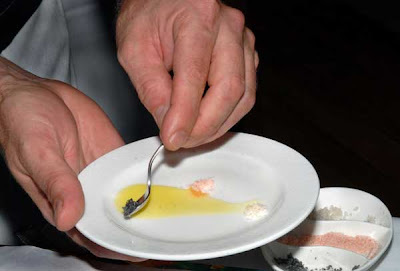 A Trio of Salts with Extra Virgin Olive Oil. We started with an Italian white wine, the Antinori Vermentino. ($8), nicely complementing the Crispy Assortment, below. 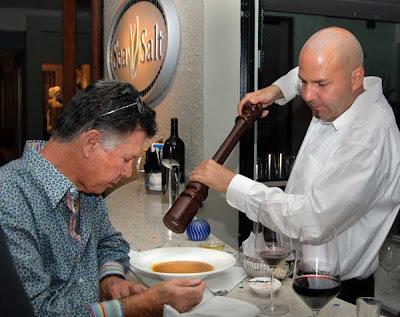 Sea Salt has over 500 wines, and the staff is knowledgeable on pairing. We loved the generous serving and the delicate, crisp batter of the Crispy Assortment of calamari, shrimp, oysters and scallops with salty lemon ($19). The batter had just the right amount of salt, pepper and light spicing to complement the delicate seafood. 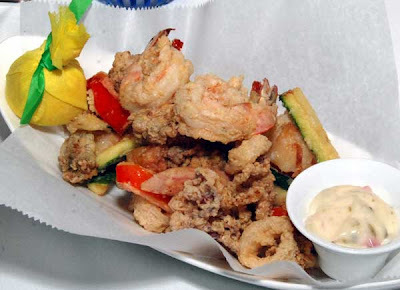 An appetizer larger than some entrées in Naples, one could not ask for fresher or better quality seafood. My dining partner said “You can taste the freshness of the seafood underneath the batter, and tell it’s good!” The wine is a great match for this and other seafood. The Thin Slice Sauteed Calamari with Portobello mushroom cappuccino, root vegetable fettuccini, and quail egg was a hit (12). 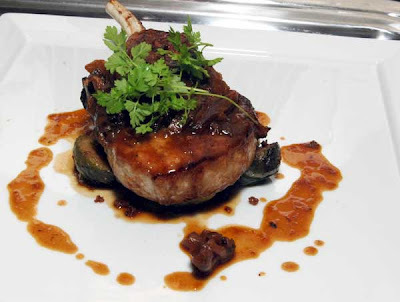 A delicate gem, it shows Chef Fabrizzio’s mastery of cooking all ingredients perfectly, balancing their tastes, and creating a whole that exceeds it’s components. 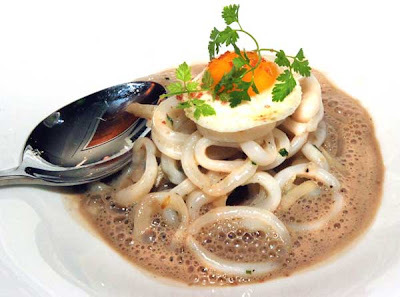 The calamari are sensually tender, and the cappuccino foam light, and understated. The poached quail egg tops it all off, with panache. The next white wine to try is an Argentinian absolute delight, the Sagta Torrontes 07 ($7.50/glass), and all we could breathlessly say was: Wow!” Light and crisp, with a hint of peach, this is a superb well priced wine we’d buy to “just sip” by itself, let alone well paired with seafood. 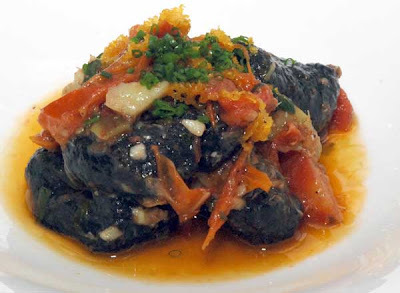 The Squid Ink Ricotta Gnocchi with ragu of artichoke and skinned tomato, topped with bottarga (15), lets the Ricotta cheese taste and texture stand out, accentuated by the dried tuna roe, or bottarga, with the tomato’s richness tying it all together. We scooped up the sauce with complimentary crusty bread slices, tender and soft on the inside. One could also try the three Carpaccios- Tuna with Quail’s Egg (14), Salmon with Capers, red onion, mustard-ginger vinaigrette and pink Himalayan salt (12), or Kona Kampachi (below), with jalapeno, seaweed and orange balsamic soy, with red Hawaiian salt (12). We wanted to try a red wine, and were pleased with the Paul Hobbs El Felino, an Argentinian Malbec, light enough for fish, and it would go well with beef. 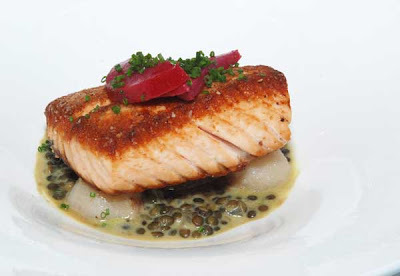 The roasted salmon marinated in limoncello (28) is “childs play” for Chef Fabrizzio, and he finishes it with a light crust, serves it atop a green lentil-mustard sauce, and tops it with a shaved red poached pear. The supporting veggies are roasted cipollini onions and tender turnips. The portion size is quite fine for me. 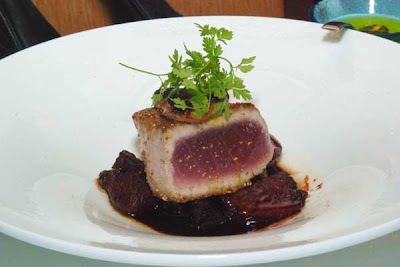 The Seared Tuna (32) is properly served rare, with rosted red and gold beets, topped with a heavenly sautéed morsel of high grade foie gras (the cheaper kind doesn’t sear this well), resting on a balsamic reduction and roasted onions-delicious. This is a decent portion size, a better grade tuna than often offered elsewhere, elegantly presented. 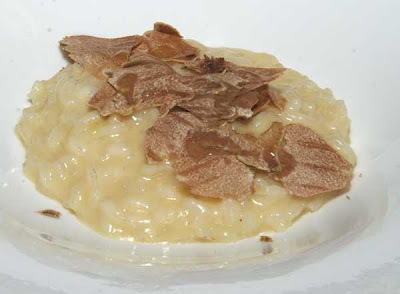 The White Truffle Risotto with white truffle oil is heavenly, with a generous portion of shaved white truffles on top. This is "the food of the gods", delicate on the palate, and truffle- earthy at the same time. See if this special is available-well worth it! 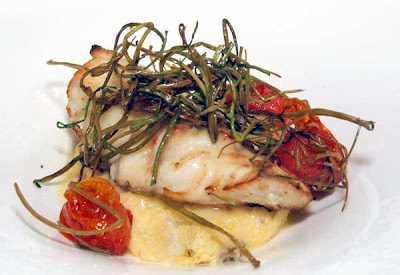 There’s also Swordfish Crusted with Crabmeat, served with tomatoes, thyme sauce, and baby artichokes (32), and Broiled Black Grouper with grape tomato pops and chives, served with shiitake shrooms and truffled soft polenta. (32). There’s also a Braised Lamb Shank with fig and fennel, served over fontina and Swiss chard mashed potatoes (28), a grilled brick pressed young chicken (27), and Five Spice Dusted Bone- in Prime Ribeye (below) with black truffle zabaglione, roasted shallots and fingerling potatoes (42). I’d come here just for desserts, too. There’s almost a dozen gelati and sorbets, each for just $2.95. One sorbet contains mango, ginger, and green tea. Gelati include a double stracciatella chocolate, and a vanilla and white truffle gelato. Also, there’s mini-sized deserts for just $3.50, with Cappuccino Tiramisu, bread pudding, Chocolate passion fruit, and even an almond linzer, to name a few. We loved the fresh Pistachio gelato, (below left) creamy as it should be, not like an ice cream. 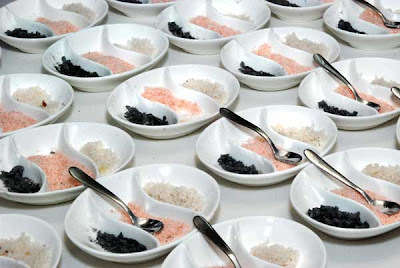 The Black Raspberry-Candy Orange Sorbet (above right), topped with black salt was my favorite- by a salt grain. 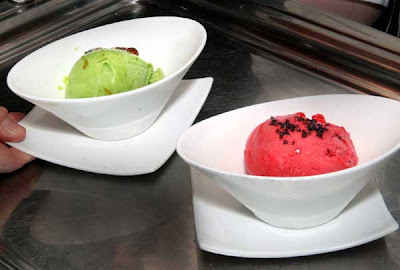 Gelato is made with less air than American ice cream, so it's richer in taste. It's also kept not as coldly frozen as ice cream, so it stays creamy. Put any gelato in your home freezer and it turns solid-bad move! For chocaholics, there’s a large assortment of Norman Love’s chocolates for $2.25 each. There’s one made especially for Sea Salt, with, what else, a topping of crunchy salt. Visit the market back on the left, before the kitchen, with sea salts, meats, cheeses, and more to buy and try. The food is first rate at Sea Salt. Fresh, creative, and it tastes terrific. Check it out!. 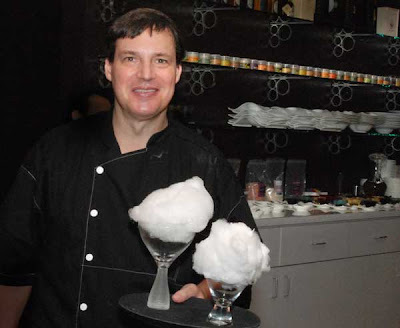 Cotton Candy comes with the Check! Let me know your opinion and experience with Sea Salt! New years eve. Good meal. extreme markup on wine and drinks!! Watch your BILl . They do play games. Charged us for soups that were included in the package for 8 people $ 54 . Removed charge ,but tried to get away with it!! Again watch your bill for KITING!! They have proceeded to lose 8 future customers and our friends!! and atmosphere very festive...but... we were looking forward to the cotton candy that everyone talked about - and were told that the "machine was broken and has been for quite awhile". Disappointed! I love this time of year-sitting outside at Sea Salt, and watching the world go by! Too bad the machine has not been fixed...hope they get a replacement soon.